Here's more "Tomodachi". 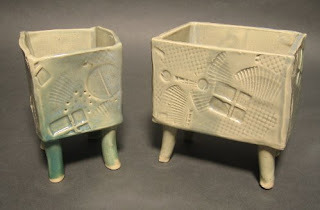 These two are done in celadon glaze and made from imprinted slabs. The imprints are shells, a couple of bought stamps, a large fragment of patterned plastic from a parking lot and styrofoam packing materials. I particularly like the last two shots of another plain one. 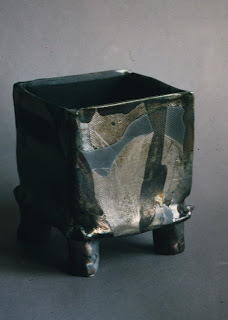 The glaze is Cayote's Light Shino and the breaks are very pleasing. 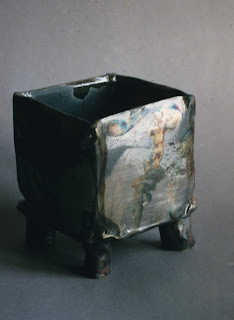 I hardly ever make anything with a raku finish, but this little pot worked well--even though I had no idea what the finished glazes would look like. All four sides were variations of direct brushwork. I refer to these forms as "Tomo-dachi" or "little friends" in Japanese. And that's what it turned out to be. A cyber friend of mine who is a musician bought it and that's where he keeps his guitar picks. Attach the beginning loops to something stable like a door knob or chair finial. The beginning must not be allowed to twist. After establishing the base of the loop by twisting it around a few times, separate into two equal strands of fiber. 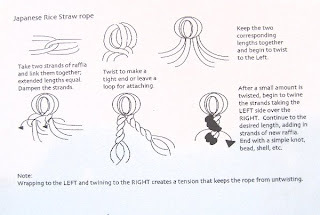 The two strands are twisted in the SAME direction and made into rope by twinning in the OPPOSITE direction. This creates the tension that keeps the rope from untwisting. 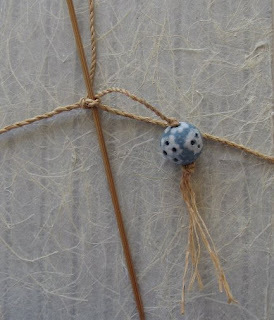 You can finish off the rope with a knot, bead, or weave it back into itself. Lots of possibilities! 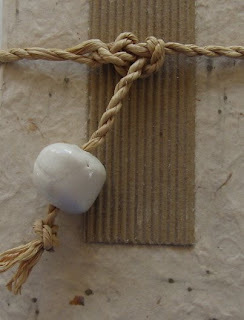 You can use single strands of fiber to make a very fine rope or a grouping of strands to make this rope. In this country, raffia is the closest thing to rice straw and has the fiber strength. Check out basketry suppliers, arts & craft stores, needlework shops for sources of fiber. Using raffia, the rope can be made of colored fibers or dyed to match a glaze. 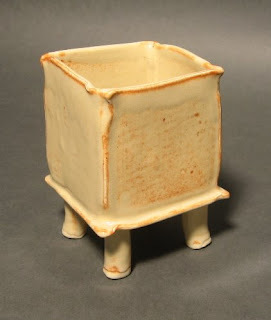 It works well on lugs, handles and as webbing on a pot. 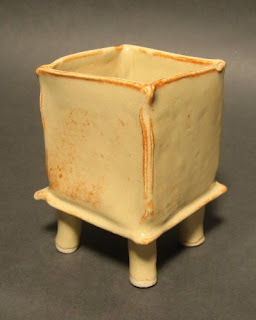 It can be used to attach a lid to a pot or loop over the top to hold a lid down. It works very well with rattan and natural twigs and wood as well. You're only limited by your imagination! 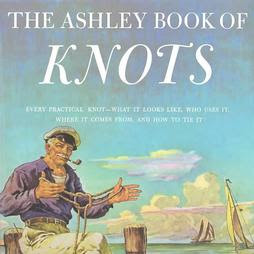 An excellent resource for a world of knots, this reprint of the original book can be found on many discount websites. I found mine in a used book store and couldn't pay for it fast enough! Ran across this slide during my converting slides to jpegs project. This sorta sums me up....a bit of discipline and impulse. 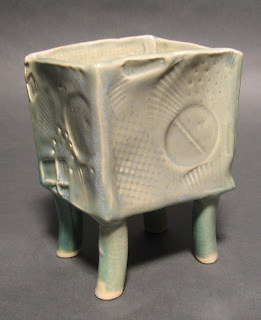 Which is, by the way, the name of the piece. Unfortunately it doesn't exist anymore. "Discipline" does, (is that not the case?) 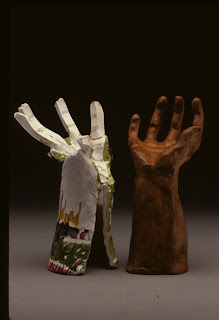 but "Impulse" was made so much on impulse that one finger fell off after a short time, I trashed it. "Discipline" is fun to have around for scratching the head, resting the chin and holding a book, however. Maybe some day, on impulse, I'll reconstruct the whole thing again. So while I'm waiting for the 'tile guy' to begin laying new floor tile in the bathroom where the shower-tile-project-that-won't-die is located, I was going through some more slides of previous work and came across a slide of one of the soft jewelry pieces I made some years ago. 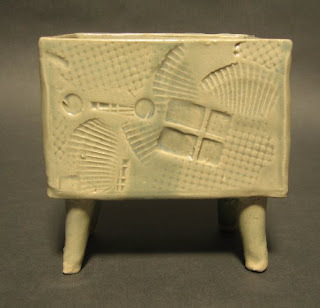 Before clay, I worked extensively in fibers; weaving, needlework, ethnic clothing design, baskets. The funny thing about weaving was even before I got my hands on a loom, I knew how it all worked. but I won't get off on that right now--weaving is a whole 'nother bunch of posts. 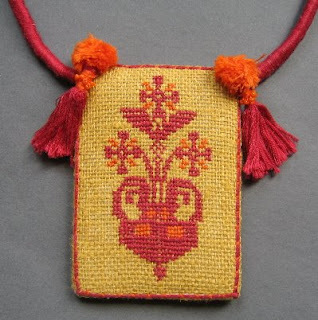 The soft jewelry grew out of designing ethnic clothing. At one point, I was heavily involved with The Children's Art Center in Norfolk VA and a the Textile Designer's Association of Virginia. A wonderful teacher, Margot Carter Blair arrived upon our horizon and taught a great series of classes on design and application of a huge range of fibers and embellishments. She is a gifted and inspiring teacher. 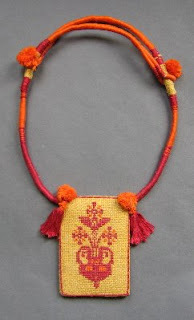 This necklace is a pendent made of a cross-stitch pattern I designed, cotton embroidery thread tassels and beaded pom-poms and wrapped cording. The length is adjustable by positioning the two loops on either side of the back section. It can remain at the shortened length or lengthened by slipping the loops over the pom-poms on either side. The natural tension of cotton upon cotton holds the adjustment in place. One day, I will repeat the necklace, but instead of cotton, use more luxurous materials--maybe a porcelain pendent and matching beads. I'm so glad I started trying to remember to keep a photography record of my work early on. It's great to have the visual references in order to dip into them in order to think about new variations on old themes.